The information contained in the website is intended for healthcare professionals in the United States only. I certify that I am a healthcare professional in the United States. an interval of 7 days between applications to the same site. perspiration may loosen the patch or cause it to fall off. 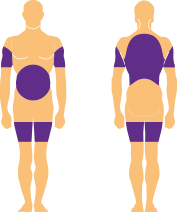 There are 4 different areas where the Androderm® patch can be applied: the back, abdomen, upper arms, and thighs. Do not apply Androderm® to any other parts of your body such as your scrotum, buttocks, or over a bony area. 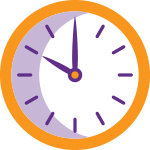 Each night you’re going to apply a new patch to a different spot from the previous night, with an interval of 7 days between applications to the same spot. However, sometimes the area where you had your Androderm® patch may get red after the patch is removed. If the redness doesn’t clear up, talk to your healthcare provider. He or she may suggest using an over-the-counter hydrocortisone cream after removing the patch. Androderm® is to be applied to your back, stomach area, upper arms, or thighs only. Before applying Androderm®, make sure that the area you’re applying it to is clean, dry, and has no broken skin. Make sure to avoid areas that are oily, perspire heavily, or are covered with hair, since Androderm® may not stick well to these areas. Do not apply Androderm® to your scrotum, buttocks, or over a bony area. Tear open (don’t cut!) the pouch and remove the patch, which has 2 tabs. Remove the protective plastic liner and silver disc from the patch. Hold on to the tabs on the patch and the protective plastic liner and gently pull the two apart to remove the plastic liner and silver disc from the patch. This will expose the adhesive and central reservoir area on the patch. In those cases, throw away the patch and the liner and get a new Androderm® patch. Apply the patch right away after you remove the patch from the protective pouch and remove the plastic liner. If the liner is hard to pull off, or if you see any glue or adhesive sticking to the liner, do not use the patch. Instead, throw it away and use a new one. Be sure to avoid areas that are oily, perspire heavily, or are covered with hair, since Androderm® may not stick well to these areas. Learn exactly how to put on the patch. Androderm® is put on once daily in the evening. Some men apply it near bedtime—in the clinical trial, men put it on around 10 PM. By putting the patch on at night, you get the most testosterone in the early morning and less at night. You don’t have to cover it—the medication is contained in the center of the patch and is surrounded by a backing that sticks to your skin. Use Androderm® exactly as your physician tells you to. Do not change the dose without discussing it with your healthcare provider. If your Androderm® patch becomes loose, smooth it down again by rubbing your finger firmly around the edges. Do not tape Androderm® patches to your skin. Sometimes, a patch may fall off, and in that case, the time of day it happens matters. at your regular time that evening. your regular time that evening. 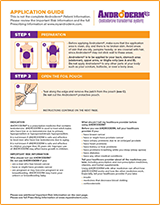 Do not use an Androderm® patch if the pouch seal is broken or the patch is cut, damaged, or changed in any way. Throw it away and use a new one. Androderm® and magnetic resonance imaging (MRI) scan: Patches that have aluminum in them can cause skin burns at the patch site during an MRI scan. Because Androderm® contains aluminum, you should take off your Androderm® patch before you have an MRI. Follow the guide above for applying another patch after your MRI. ANDRODERM is a prescription medicine that contains testosterone. 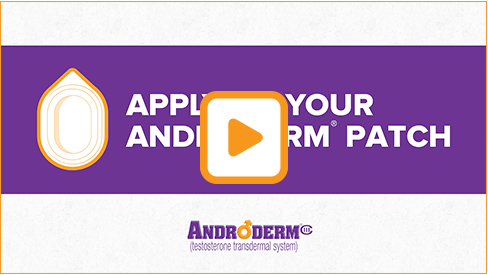 ANDRODERM is used to treat adult males who have low or no testosterone due to certain medical conditions. It is not known if ANDRODERM is safe and effective to treat men who have low testosterone due to aging. Blood clots in the legs or lungs. Signs and symptoms can include leg pain, swelling or redness of your legs, difficulty breathing or chest pain. Tell your healthcare provider if you have any side effect that bothers you or that does not go away. These are not all the possible side effects of ANDRODERM. Please call Allergan at 800-678-1605 for any product-related question. The prescribing information contains a phone number that is no longer associated with Allergan and the respective package insert is in the process of being updated. Androderm® and its design are trademarks of Watson Laboratories, Inc., an Allergan affiliate.